As we talked into a previous post, Word of Ancient Egyptian Hieroglyphs, Hieroglyphs were at the heart of the Egyptian civilization. These elaborate symbols, though ideal for large inscriptions found in temples and monuments, were too difficult for day-to-day scribbling, so other scripts were evolved in Egypt in parallel. These were the ‘hieratic’ and ‘demotic’ scripts, which can crudely be thought of as merely different fonts of the hieroglyphic alphabet. Then after the rise of Christianity, which outlowed their use in order to eradicate the link with the pagan gods, ‘Coptic’ was used, a script consisting of 24 letters from the Greek alphabet supplemented by six demotic characters used for Egyptian sounds not expressed in Greek. So in the fourth century AD, within a generation, the Hieroglyphs scripts vanished, the last known writing is found on the island of Philae, date from AD 394. Following the complete loss of the language in the fourth century, in later times scholars who tried to deciphered them where confused by the fact that the language seemed to be a primitive picture writing, and their translations were the actual meaning of the signs and lolograms. In fact, the hieroglyphic script and its relatives are phonetic, which is to say that the characters largely represent distinct sounds, just like the letters in the English alphabet. Even if Napoleon Bonaparte despatched a team of historians, scientists and draughtsmen to follow in the wake of his invading army the French were force to hand over the 118cm high, 77cm wide, 30 cm deep stone slab to the English who took it to the British Museum, where it remained ever since. 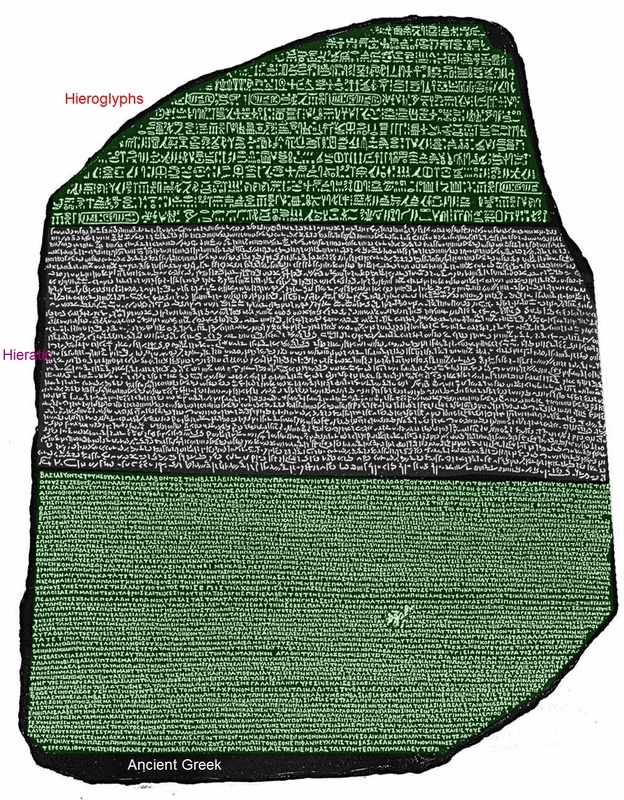 The translation of the Ancient Greek on the stone revealed that the Rosetta Stone contained decree from the general council of Egyptian priests issued in 196 BC. The assumption was that the 3 texts on the stone were actually the same translation of the same decree. As nobody had spoken the ancient Egyptian language for at least eight centuries, so it was impossible to establish the sound of the Egyptian words, which was essential for the phonetics of the hieroglyphs. In a matter of speaking Rosetta Stone is actually an ancient version of what GlyphViewer application is trying to do. 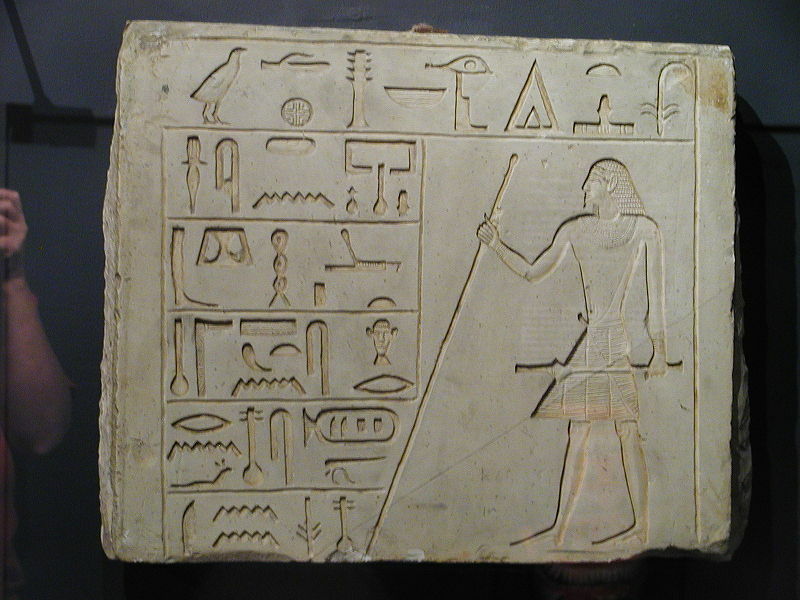 A first serious attempt at translating was made by Thomas Young, when he focused on a set of hieroglyphs surrounded by a loop, called a cartouche. He suspected that the highlighted hieroglyphs represented something of significance, possibly the name of the Pharaoh Ptolemy, who was mentioned in the Greek text. 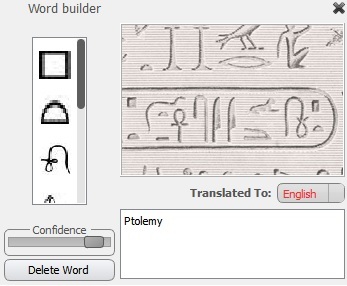 He succeeded to match the letters of Ptolemny with the hieroglyphs, correlating most of the signs with their correct phonetic value because a pharaoh’s name would be pronounced roughly the same regardless of the language. Let’s try to guess what Thomas Young would have done if GlyphViewer application was available in his time. 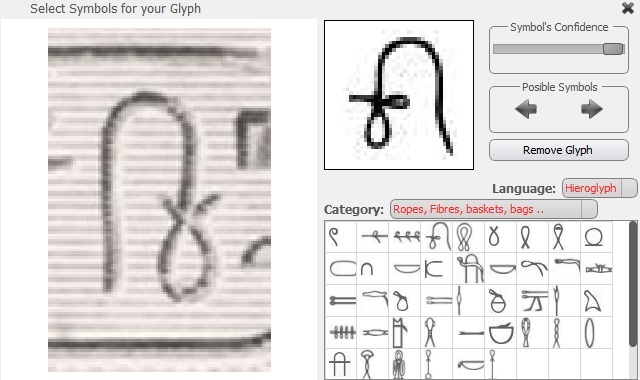 This will be a small tutorial on how you can use GlyphViewer application to help translate Ancient Egyptian Hieroglyphs. Notice the selected light blue area. 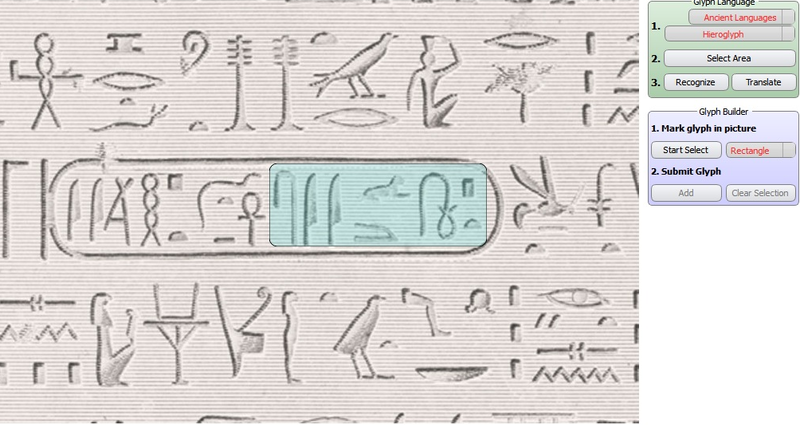 This is what when you click Recognize for the right side the OCR engine will be given to try to match hieroglyphs. All you need to do is click on Recognize. Thomas would then noticed that some new glyphs are highlighted on the image, with a rectangular area. Possibly the OCR engine will not perform very well and Thomas would be required to do the glyph matching manually by using the Glyph Builder dialog, using dragging the rectangle or polygon around the desired glyph area, then clicking Add to create a new glyph. He would then click on it to add symbols he would though to have been correct. If you consider that a symbol match is wrong, just drag the confidence level to 0 and that symbol will be deleted for the glyph. If you consider that the found glyph is wrong all together just click on Remove Glyph and the symbol will be deleted. You should use the Category combo to search the symbol in what you consider the glyph looks like. Manually identifying glyphs can take some time at first (there are over 800 symbols to choose from) but you will see that the majority of glyphs have quite common symbols. Now you have all the Ptolemy symbols, from right to left (the read direction is this due to the birds and animals orientation), in Gardiner’s notation: Q3, X1, V4, Aa16, E22, M17A, S39. You may hover over the symbols to see them in the original image. Also notice that the word can be translated into multiple languages. You may edit a translation, or add more translations by choosing a new language from the Translated To: combo. Now it’s time to actually build a translation. Now choose the language you want to create a translation from the Translated To: combo and enter it. You can also link words that you have previously translated. 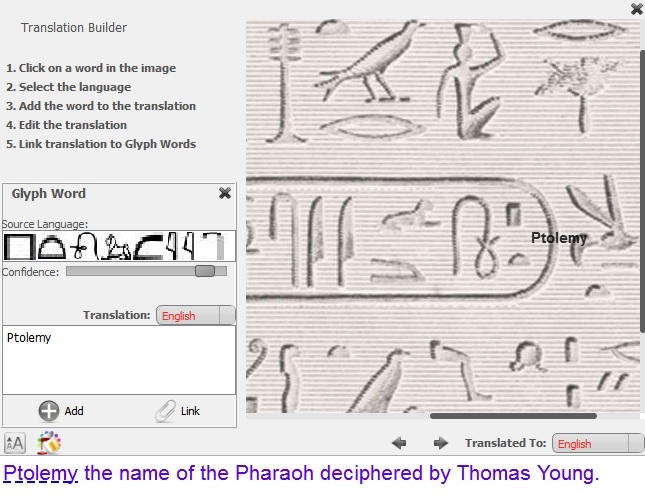 Find and click on the Ptolemy text in the image, notice how the GlyphWord dialog appears. Now select the portion of the text you want to link to this word then click on the Link button. That’s it, notice how the Ptolemy text got a blue underline, the link. When you will hover over the translation you will see that both the word and the associated glyphs in the word will become highlighted. Don’t forget to play with the font and color as well. Also you may translate it into as many languages as you like, just make sure to link the words again. You may use different font and colors for each translation.